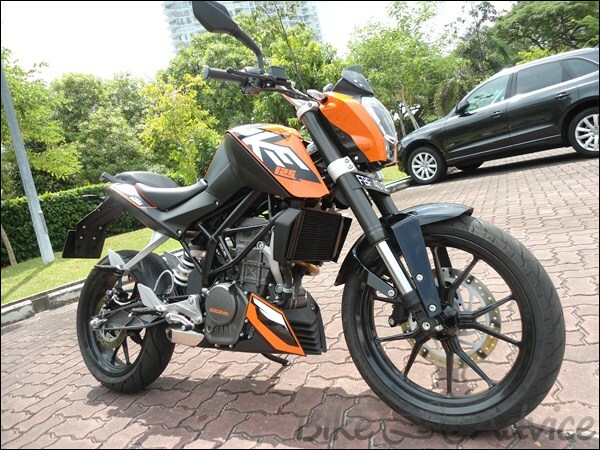 KTM Duke 125 was a very anticipated motorcycle for Indian bikers. Not because it is manufactured in India but because of the reason that the Indian bike market had huge hopes that it would be the first KTM for India. 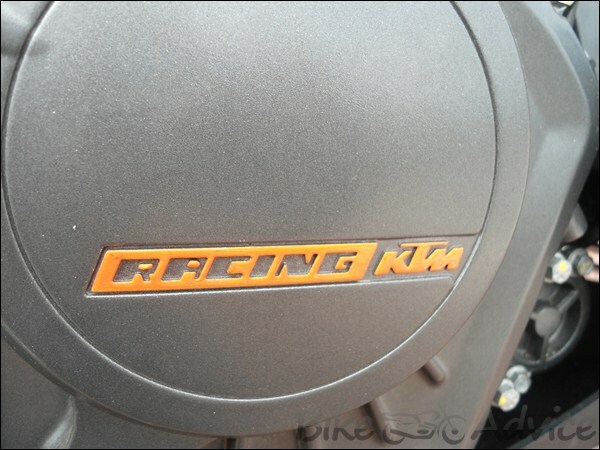 However, the KTM Duke 200 ended up being the first for the sub continent. As you know we covered the motorcycle’s launch in Singapore, we were given the motorcycle for a brief period and here are our first views. There aren’t many reviews of the motorcycle but remember this particular model is not for India. 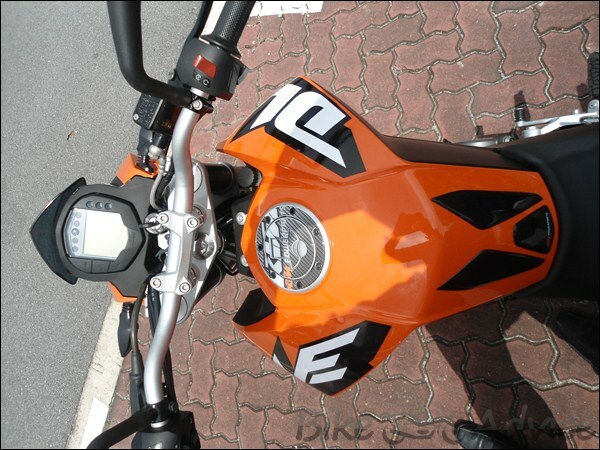 As soon as we got into the playground along the East Coast Parkway, there was a KTM 125 Duke waiting for us. I had to go in a (semi) formal attire as I had to attend the inauguration ceremony of the bike as well and that’s the reason why you see me riding this bike in a white shirt. 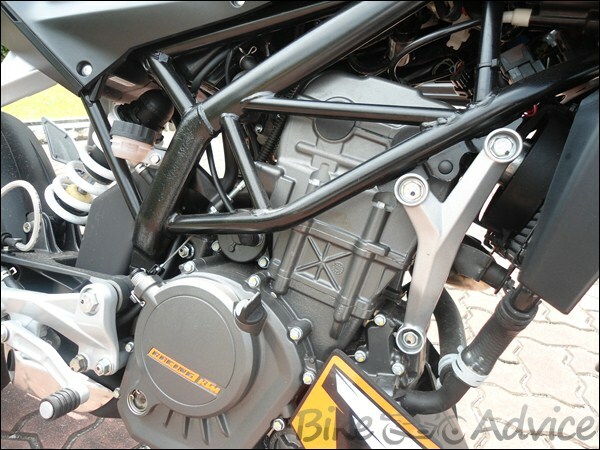 The bike is equipped with a 124.7 cc single cylinder, liquid cooled engine. 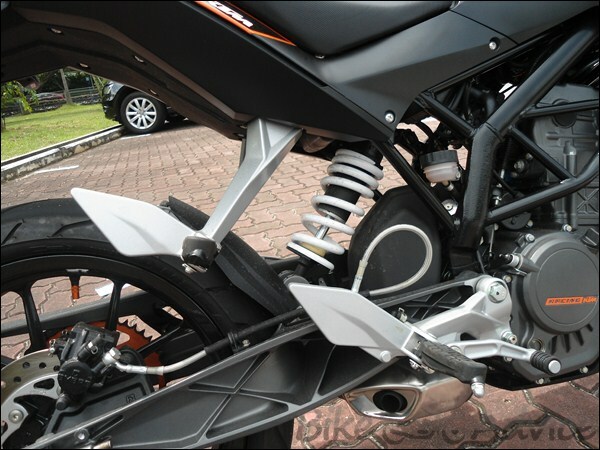 But at the very first instance, the KTM 125 Duke makes you understand the fact that she has real good power to play around with. The maximum rated power output is 15 PS which is 4 horses more than the Yamaha Gladiator in India. The exhaust note is one of its USP and it is a perfect mix of an off roader and a sportsbike’s beat put together. The higher you throttle her up, the more you get to enjoy the sound. For visual appearance enhancement, the engine is packed perfectly in the engine compartment. The riding posture of the baby Duke is ‘comfortably sporty’ – its not a forward biased racing position and nor is it a complete commuter-like-laidback seating. Irrespective of the height of the rider, the bike makes you sit upright, and the best part is that it didn’t lead me to any kind of stress on the back for whatever kilometers I rode it on. It has got a split seat and the cushioning is on the harder side. The handlebar is easy and comfortable to hold. Though it gives a feeling that it is situated very close to the fuel tank, but it’s actually not. Bosch has taken care of the Fuel System and the Ignition system. The digital speedo console is simple which makes it very easy to read as you cruise on it. There is a gear indicator which reveals which gear you are exactly riding the bike in. KTM refers this full digital console as ‘Cockpit’. The cockpit also displays the fuel remaining and the range that could be covered with the fuel left. The bike runs on Motex Formula 4T Engine oil. The frame of the bike is made out of steel and the handlebars are all aluminium. The engine comes paired with a 6 speed manual gearbox and I believe these many gears for a 15 PS 125 cc motorcycle are not really necessary. The gear shifts are not very smooth but the ‘slotting’ is precise. 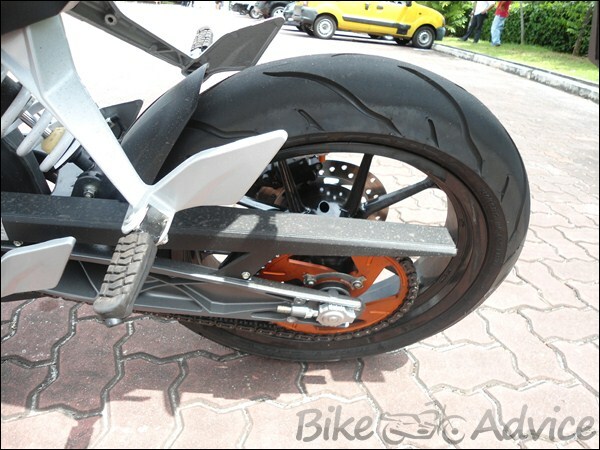 At 185mm, the ground clearance of Duke is 30 mm higher than the Gladdy which makes gliding over bad roads a cakewalk. It weighs 124 kg and its spread makes it feel light. It has got real wide (110/70 front, 150/60 rear) tyres which offer phenomenal grip. The mono-suspension at the rear offers the best of the riding experience and helps in quick direction change. The front wheel is provided with a four piston, radially bolted caliper brake disc of dia 280 mm and the rear wheel has a single piston, floating caliper and 230 mm brake disc – from Brembo. 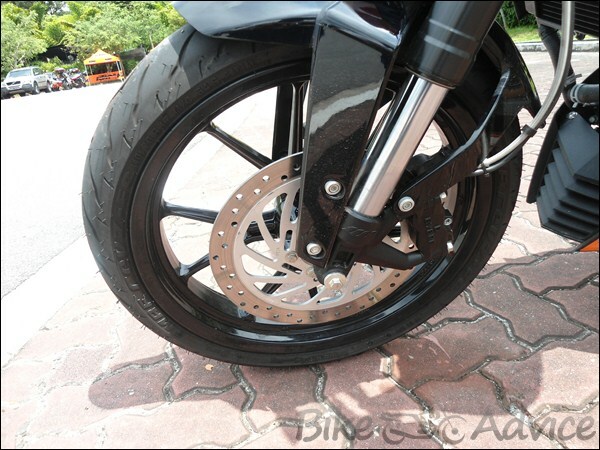 Unlike Indian bikes, the front and the rear discs are fitted on the opposite sides – Note that the front disc is on the left side and the rear disc on the right side. It comes with an underbelly exhaust. The compact, three-chamber silencer is positioned close to the machine’s overall centre of gravity. The bike boasts of a very sporty fuel tank – capacity of which is 11 litres. It also provides a very fitting knee recess to the rider. 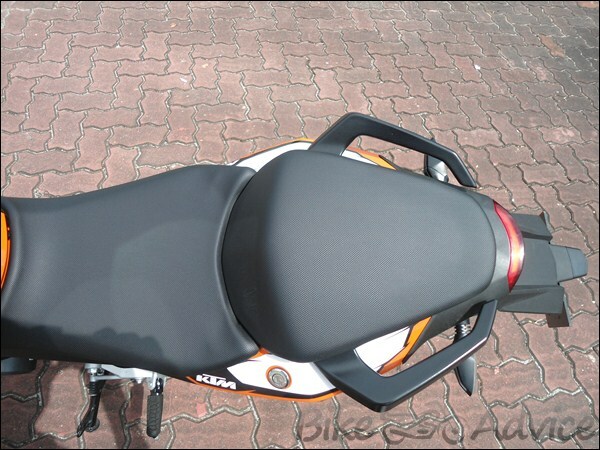 The small engine guard at the bottom in orange colour is a major styling factor for this bike. 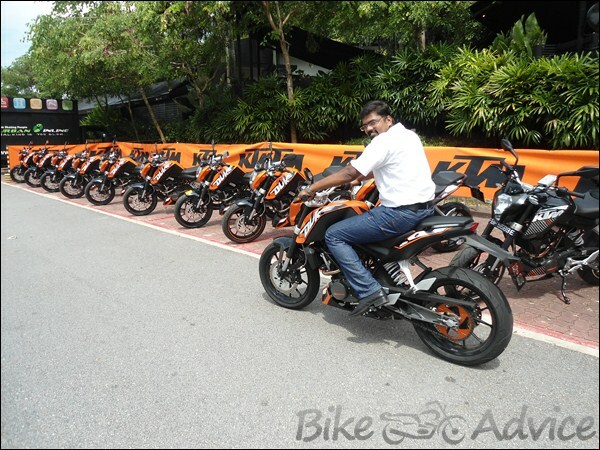 KTM is also projecting it to be a low fuel consuming motorcycle. 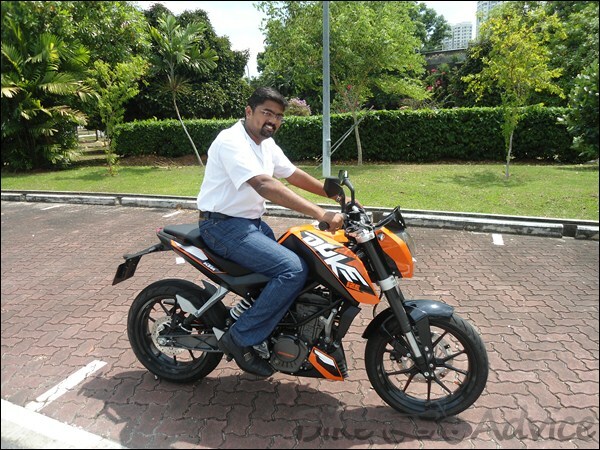 The limited experience I had with the KTM 125 Duke made me realise that the Duke line up of bikes have immense potential. This has also created a lot of interest within me about Duke 200 – the Duke that is set for launch in India.